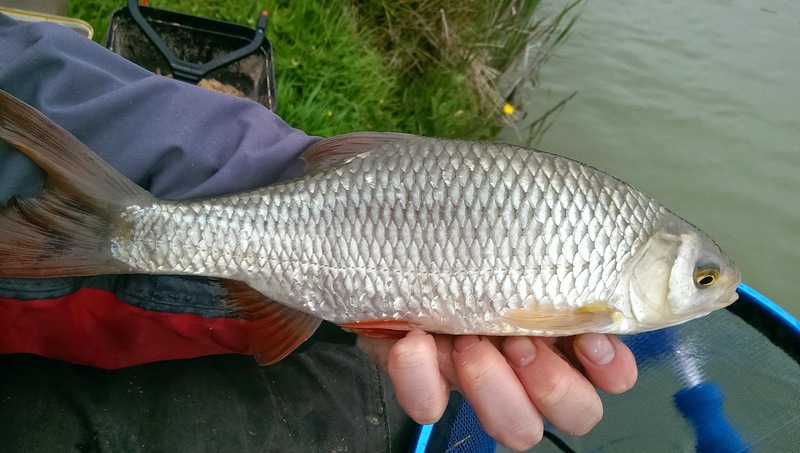 I’ve slowly but surely been working my way through the very extensive list of fisheries in Somerset, and although I’ve still got a good chunk left to sample, the fisheries closest to my house have been visited on more than one occasion. 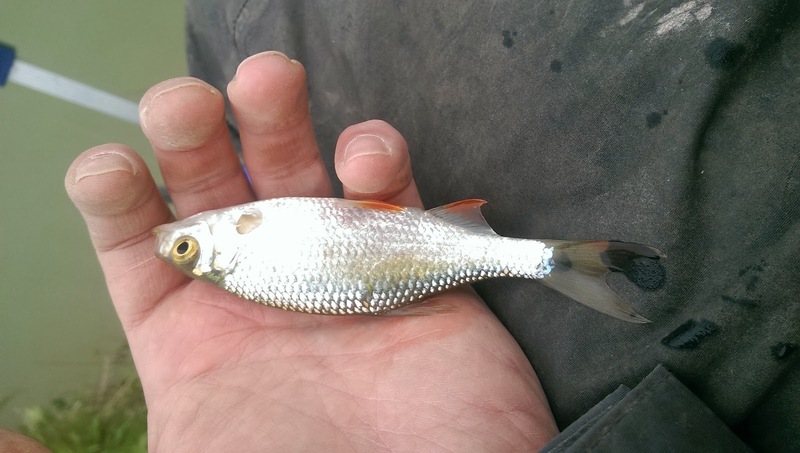 Wanting to fish somewhere new I decided to travel down the a3066 and visit Mangerton Lake. I’ll be honest, looking at the websiteI didn’t hold out a great deal of hope, aside from the fact that I knew I’d be in a picturesque location. A quick phone call the night before to make sure I was going to the right place, and I was set. I arrived at the farm house (where you pay into an honesty box) picked up my ticket and made my way back down the track towards the fishing lake. It was a nice lake and bigger than I expected, and after a quick walk around I picked a peg which looked to have a huge margin swim. In the time it took me to set my gear up the wind really picked up, and was now blowing firmly into my face. I reassessed my position before setting any more equipment up and deciding on moving around to my right, so the wind would be off my back, making holding a pole a lot easier. My plan of attack today would be a straight forward one, target the lakes smaller fish on Maggots and Corn, and if there were any about, target the Carp on Pellet and Meat. I had a quick chat with an angler who was also fishing the pole in the other half of the lake “They go up to 30lb” he assured me, “I’ve had them up to 23lb on paste in here”. I hoped I wouldn’t run into one of those beasts. I was surprised how quickly the lake got deep (although apparently it goes to 20ft) and at 9 meters I was fishing 8 feet of water – Good job I made a few new rigs! As the water temperature was up I opted for a groundbait/pellet combo. Also I had some scraps of old groundbait which I wanted rid of, so I balled in 3 jaffa’s on the open water line and 2 down the margin with some bigger pellets for any potential Carp. First put in on “old faithful” (double red) saw a small roach take before I shipped out to my 9 meter open water swim. So swinging the fish in I went back out on Corn hoping to put of the fish long enough for me to pour a cuppa. The float settled and instantly took off, my 8 elastic was no match for whatever this was and the hook pulled! I shipped in re-baited with corn and shipped back out. This time the float stood stationary for a minute or two before it slid away. This wasn’t a Roach either and before long I was putting my 10 elastic under some significant pressure. 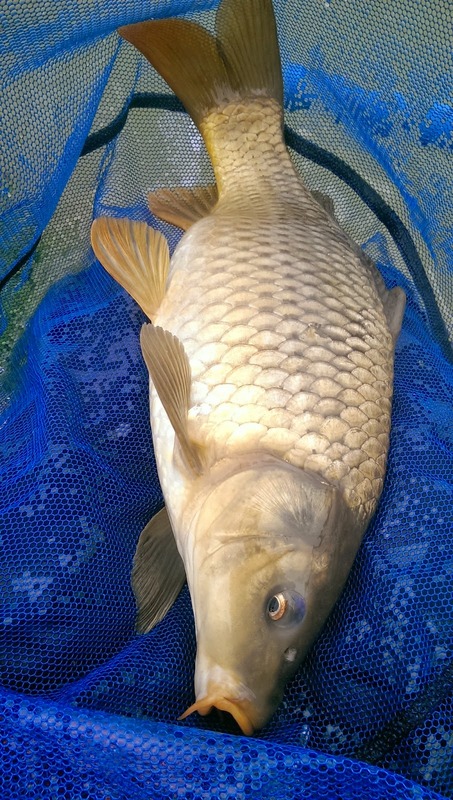 I was conscious of my lighter hooklength but I eventually brought to the net Carp of around 3lb’s. 2 more trips out to open water were enough for me before I decided on going down the inside. In the meantime a father and his 2 sons had set up opposite and were using dog biscuits to bring the Carp to the surface. There are A LOT of carp in this place – borderline commercial levels (without the F1’s). Going down the inside proved an immediate success and I was into a fish instantly. Another carp of around 4lbs. This fish was very long and lean so it was fighting like a train. This continued for the best part of 2 hours, and as long as I kept the feed going in the fish would happily stay. Watching the family opposite catching fish off the surface was also enjoyable, and when they packed in fishing at around 12:30 I guestimated that they had caught 10 – 12 fish between the 3 of them. The feed they had put in was still being busily gobbled and I could hear the constant “SLURP” of fish taking off the surface. Temptation got the better of me and I quickly set up a stalking rod with a 3ft 6lb hooklink, attached to a hair rigged cork ball. I threw a few 8mm floating pellets in and they were instantly slurped up and 3 or 4 foraging fish. Before long I was in to a nice common of just under 5lbs. Followed by a beautiful mirror Carp around the same weight. It was difficult to guess the weight of these fish as some were short and chunky and some were very long and lean. I caught another 4 off the surface before returning to my seat box. 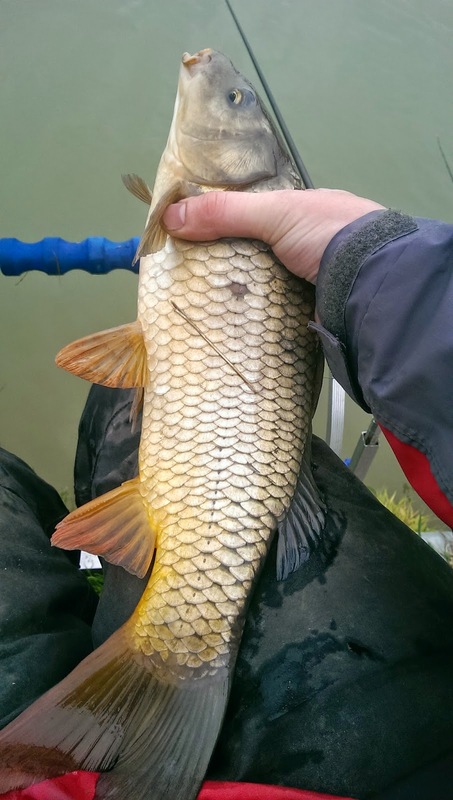 I shipped back out using double corn and was instantly rewarded with what I thought was a small carp. Nope, a bloody huge Roach. 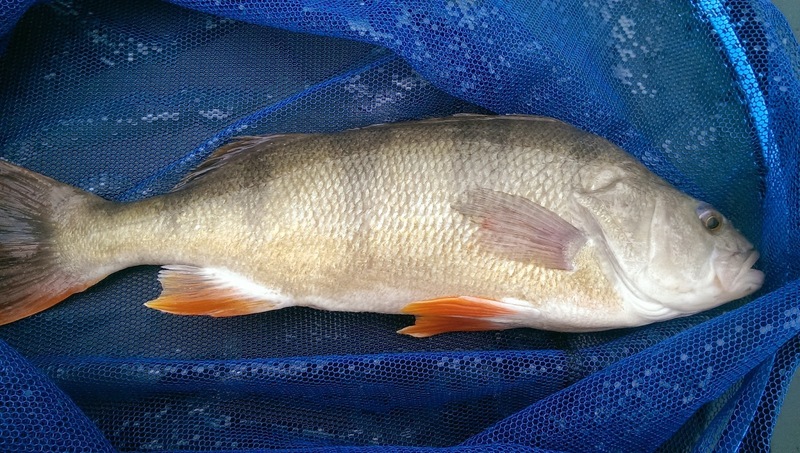 This was followed (also on double corn) by a huge 3.01lb spawned out Perch. I couldn’t believe it when I got it in the net, and couldn’t help but wonder the weight of it before spawning. Easily a new PB. What a belter. This photo doesn’t do this creature Justice. It was huge. The fish were coming thick and fast now, it was turning into a proper “purple patch” where everything I would put in front of the fish was being taken Pellets, Meat, Dead Maggots, Corn everything! 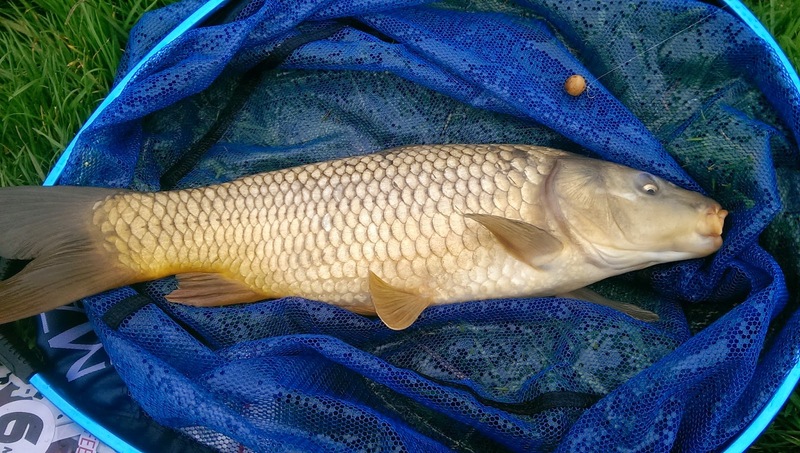 Some of the Carp I was catching seemed to have an odd dark colouration, and I wondered if some were bred with Koi (not that it mattered). These fish were constant and had I used a keep net I would have been pushing 90lb+ by the end of the day. The fish opposite were still very much on the feed, and some were even starting to feed off the surface in my peg, but I remained fishing the deck until I decided to call it a day around 4pm. Once I had packed up I walked over to the angler who was fishing the paste, and as I approached I saw he was playing a fish. It looked fairly sizable and on asking, the angler was using a light Maver hollow elastic. It was at full stretch, nevertheless slowly but surely the fish was coming closer to the bank. Having never really been a fan of Hollow or Hydro elastic I suppose this may have been turning point for me in seeing how it works, and how big a fish you can land or relatively light elastic. The chap was working the pulla bung and after a few minutes a lump came to the surface. It was huge. So much so that it almost didn’t fit into his landing net, eventually it did, on the 3rd time of asking. This fish was well over 15lb, and was landed on a 4lb hooklength. Obviously I helped him photograph it, shame I didn’t take one myself. So maybe my next pole will have some pullas? Maybe…. Fishability – **** – Good lakes, 2 sunken islands, some overhanging trees and plenty of rushes for features. Make deep rigs though. Accessibility – **** Easy to find and just off the a3066, there are however no facilities on site. Value for Money – *** – I only put 3*s as I was caught out by the honesty box at the farm. Despite knocking for the best part of 10 minutes to try and get some change I still got no answer (even though people were up and eating breakfast), so this trip cost me £10. Disabled Access – ** ½ – You would not be able to wheel your chair down to the lake unassisted, however there is suitable space when at the lake side as the pegs are quite clearly defined. 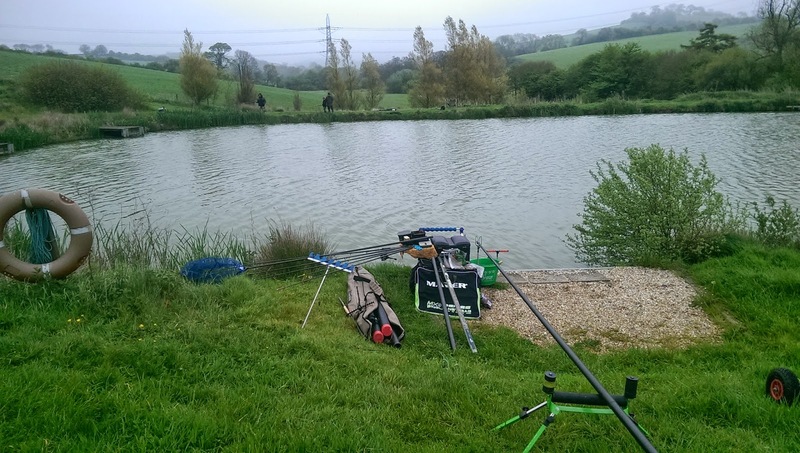 Trip #4 – Swillington Park Lakes – In Meat We Trust!! !